Congratulations to our 13 National Merit Finalists! National Merit Finalists have been selected from 16,000 Semifinalists across the US. These students are now in the running for 7,500 National Merit scholarships. Starting in March and ending in June, National Merit will begin to notify finalists if they have won a scholarship. Photo attached: First row (From left to right): Thomas Easterling, MSMS English Instructor, Dr. Elizabeth Morgan, MSMS Chemistry Instructor, Chad Edmonson, MSMS Class of 1999, Cynthia Henderson, MSMS Foundation President, MSMS Class of 1995, and Chuck Yarborough, MSMS History Instructor; Second row: Indu Nandula, Olivia Viguerie, Edith Marie Green, Alexandra Magee, Talle Wilson, and Samantha Anderson; Third row: Esmond Tsang, Devin Chen, Lori Feng, Likhitha Polepalli, Ezra McWilliams, Erin Williams, and Gina Nguyen; Fourth row: Cade Burton, Bertha Mireles, Clara Grady, Erin Davis, Jack Shelton, Alisha Burch, and Cameron Thomas; Fifth row: Elijah Dosda, Maria Kaltchenko, Lane Hughes, and Austin Eubank. The Mississippi Capitol was host to 24 current MSMS students on Wednesday, February 6. The students were able to meet and converse with state representatives and senators while the legislature was in session on Capitol Day. Students were there to raise awareness about the significance of the school to the state and to represent the school. The day was also a laboratory in many ways for learning about the legislative process as well as government at the state level. “We are grateful to our legislators for their continued support of MSMS,” said Dr. Germain McConnell, Executive Director. He added, “We wanted them to have the opportunity to interact with students from their areas and to hear directly from students about the life-changing experience of MSMS. We selected students to represent various parts of the state, and of course we needed these students to be able to effectively communicate their experiences and what MSMS means to them.” “Meeting my representative was important because I had never met her before. I was able to actually talk to her and ask any questions I had. We were able to see how bills are passed in the Senate and in the House,” said Erin Williams, MSMS Senior. “Overall it was awesome to experience an environment with all of the state Senators and Representatives. It also opened my eyes to how many senators and representatives don’t know what MSMS is even though we are the #1 high school in the state. I thought we did well getting our school on their radars and representing MSMS well,” said Erin Davis, MSMS Senior. 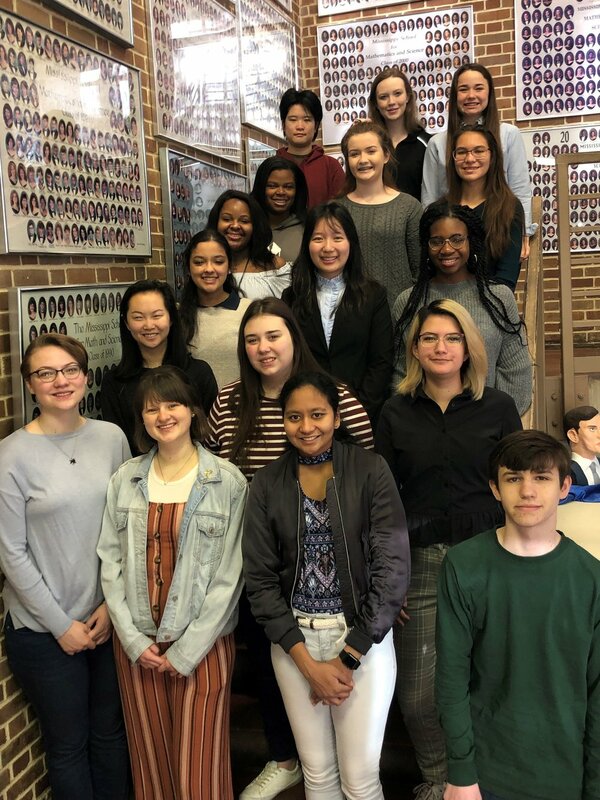 Students chosen to attend were: Samantha Anderson, Alisha Burch, Cade Burton, Devin Chen, Erin Davis, Elijah Dosda, Austin Eubank, Lori Feng, Clara Grady, Edith Marie Green, Lane Hughes, Maria Kaltchenko, Alexandra Magee, Ezra McWilliams, Bertha Mireles, Indu Nandula, Gina Nguyen, Likhitha Polepalli, Jack Shelton, Cameron Thomas, Esmond Tsang, Olivia Viguerie, Erin Williams, and Talle Wilson. Chaperones included: Thomas Easterling, English Instructor, Dr. Elizabeth Morgan, Chemistry Instructor and 1995 alum, Chuck Yarborough, History Instructor. Also representing MSMS at the Capitol was Dr. Germain McConnell, Executive Director, Sheila Westbrook, Associate Director for Advancement, LeighAlison Jones, Coordinator for Admissions, Janie Shields, Coordinator for Public Relations, Chad Edmonson, MSMS Class of 1999, Cynthia Henderson, MSMS Foundation President, MSMS Class of 1995, Karen Clay, MSMS Class of 1998, and Ryder Taff, MSMS Class of 2006. Current MSMS students will get the opportunity to travel to Jackson on January 29 to meet and talk with state representatives and senators on Capitol Day while the legislature is in session. The event serves as a unique chance for students to represent the school and raise awareness about the significance of MSMS to the state of Mississippi. Parents and alums are invited to attend. Please email Sheila Westbrook at swestbrook@themsms.org if you are interested in attending and being a part of this important day. 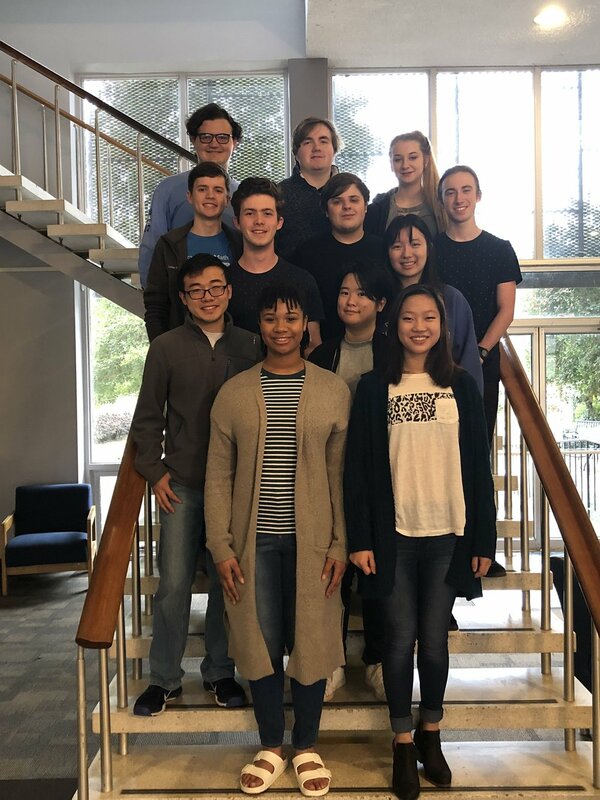 The Mississippi School for Mathematics and Science’s annual Mu Alpha Theta Mathematics Tournament has been a state tradition for nearly 30 years. Now, MSMS wants to expand the popular program to more schools, and we need your help to spread the word to schools that might be interested. MSMS students do not compete in the tournament, rather the school’s students host and facilitate the event. The MSMS Mu Alpha Theta Mathematics Tournament is just one of the many statewide outreach programs conducted by the school. The tournament will take place on February 26, 2019 at the Trotter Convention Center in Columbus, Mississippi. Currently, 6 Mississippi high schools have signed up to take part in the event, but the tournament has room for more. MSMS is asking for help identifying schools who might wish to take part in the competition. Details concerning the format of the tournament and schedule can be found below, however, the deadline for registering is January 11, 2019. The registration fee is $14 per student. For more information, or to register please contact MSMS Administrative Assistant Lauren Putnam at lputnam@themsms.org or by calling 1-662-329-7670. Written tests will also be given in these five areas. Students may compete only in areas in which they are presently enrolled in classes, with two exceptions: 1) any post-Algebra II students may participate in the Trigonometry/Pre-Calculus, or Calculus competitions, 2) students on a 4 × 4 block schedule may take the test for the courses completed in the Fall semester. Calculators will NOT be allowed on any competition. Written Test: The test will consist of multiple choice questions. The score will be the number of correctly answered questions. If necessary, time will be used to break ties. Ciphering: Points will be awarded on the basis of 2 points for questions answered correctly within the first minute and 1 point for questions answered correctly within the second minute. Team scores will consist of the sum of the scores of the four highest cipherers. Mini-Interschool Round: Each school will be allowed to enter one team, consisting of 1 to 10 students, where the team cannot have more than 5 students from the Calculus division. Each team will work as a group for the allotted time. Each team is allowed to bring THREE reference books with them to be used in the round. Students are not allowed to bring ANY electronic devices where they can send and receive information! Potpourri: Each school may enter one four-person team. The team will work logical thinking, puzzle-type questions not particularly related to any one area of mathematics. Since the mini-interschool and potpourri competitions are held at the same time, different team members must be selected. Awards and/or trophies will be presented in each of the areas of competition. In addition, trophies will be awarded to the schools with the highest combined total points for the day.